Tesla's Model 3 contains a driver-facing camera, a feature that was not mentioned by the firm during the car's unveiling. Fans of the company who had been pouring over Tesla's official imagery discovered the tiny camera nestled above the rear-view mirror. Now before you start panicking that Tesla's actually going to start spying on you there is a potentially very reasonable explanation for this. Some experts believe that in order for a car to reach the lofty heights of being Level 3 autonomous there must be a way of monitoring the driver's attention to the road. The camera would then act purely as an observer then, tracking the head and eye movements of the driver and making sure they even when Autopilot is engaged, they're not too distracted that they can't take back control of the car if something goes wrong. Tesla has officially confirmed the existence of the camera to electric car website Electrek however it refuses to reveal just what it could be used for in the future. 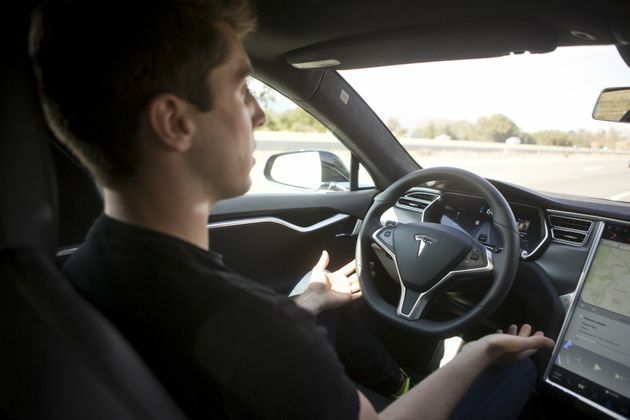 Tesla has often pre-built hardware into its cars, anticipating a time when it will be needed. This futureproofing is what allowed autopilot to be shipped to early versions of the Model S using nothing but a software update. It also gives Tesla a simpler product portfolio which is that you simply build the cars as being ready for anything and then charge customers a fee to 'unlock' those features. Tesla's CEO Elon Musk predicted last year that by the end of 2017 a Tesla would be able to drive fully autonomously from LA to New York completely on its own. It's an incredibly bold claim and while other manufacturers are already working hard to compete with Tesla, the level of computational power needed to do this is still impressive even by today's standards.